Since the start of the Russia-Ukraine war, Kremlin-controlled media and paid trolls have been spreading ridiculous lies in a campaign of humongous scale to discredit Ukraine and hide Russian involvement in the conflict. This particular tactic of hybrid war is nothing new. We’ve seen its first application on a large scale seven years ago, during the Russian invasion of Georgia. That old, crude model of Putin’s propaganda machine spewed lies that were at some points even more blatant and ridiculous. Here’re top 10 lies that many Russians still believe to this day. Lie: The Georgian operation in South Ossetia was an act of genocide that killed as many as 2000 Ossetians. This was first claimed by South Ossetian media, then repeated by Russian outlets and used as a casus belli for the invasion. Later, the figure was cited as a reason to recognize South Ossetia. 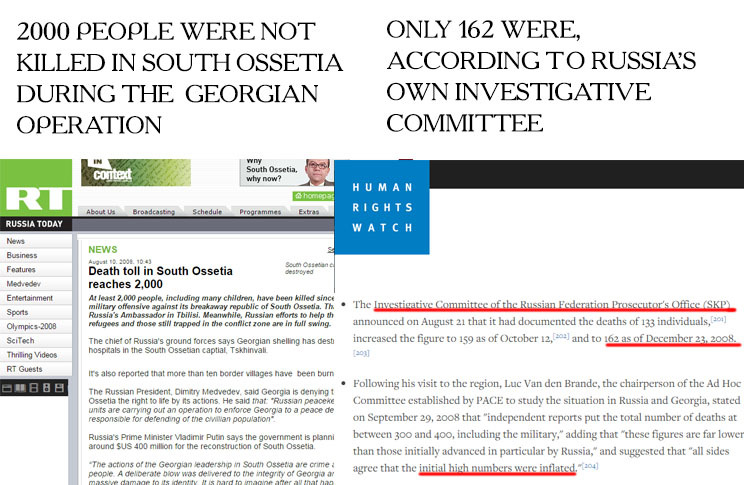 Fact: According to Russia’s own Investigative Committee, 162 inhabitants of South Ossetia were killed during the conflict (of a 30,000 pre-war population). By comparison, according to Georgian sources, the Russian invasion killed 224 Georgian civilians and a foreign journalist. Lie: Tskhinvali, the capital of South Ossetia, was leveled by Georgian artillery. Russian TV endlessly rolled clips of ruined buildings, and Kremlin poured taxpayer money to the unrecognized republic for the restoration effort. 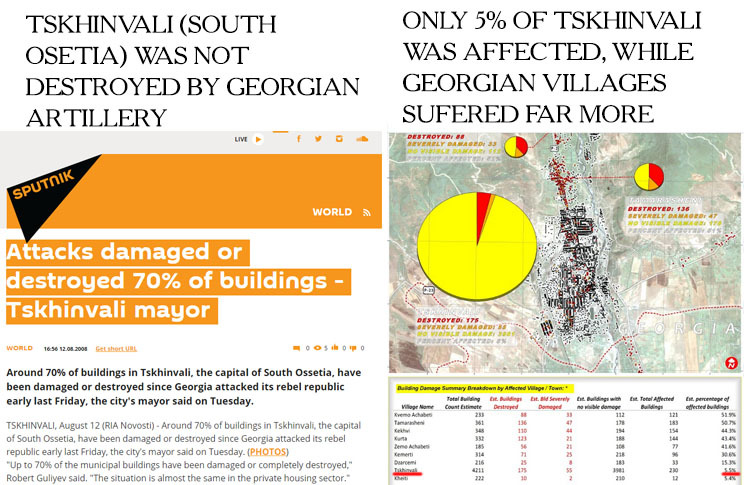 Fact: A satellite imagery analysis showed that most of the buildings in Tskhinvali were not damaged. By comparison, Georgian enclaves north of the town suffered a lot more during the Russian offensive. Later the local Georgians were driven from their land by South Ossetian militia and the villages ceased to exist. Lie: The Georgian operation was an unprovoked act of aggression. Fact: The Georgian offensive was preceded by a long period of escalation and a week of open hostilities, with Ossetian militia shelling Georgian positions and residential areas. During this period Saakashvili’s government made huge effort to achieve a peaceful resolution of the conflict, going as far as declaring a unilateral ceasefire on the August 7, which was promptly broken by the Russian side. This, together with reports of Russian troops entering South Ossetia, directed Saakashvili’s order to seize Tskhinvali and block a possible Russian counterattack. Lie: Russian troops entered South Ossetia only in after noon of August 8, the next day after the Georgian invasion. This was Russia’s response to the South Ossetian request for aid. 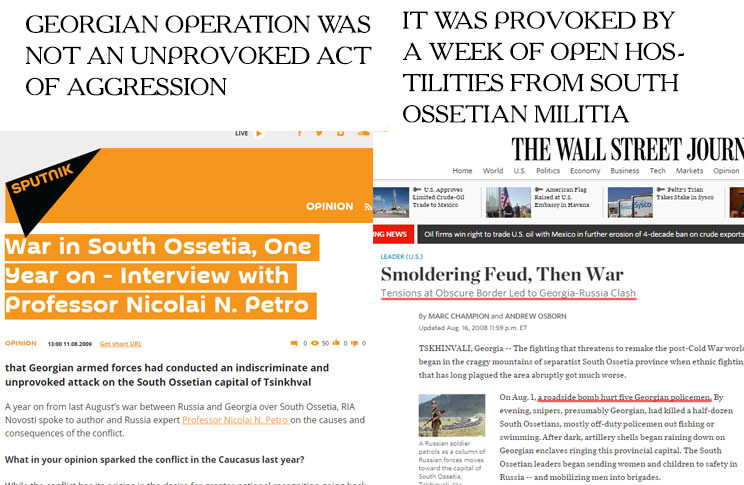 Fact: Interviews with Russian soldiers and Georgian intercepts suggest at least some Russian troops were inside South Ossetia as early as August 7, 2008, before the Georgian offensive even began. Other troops were staying on the North side of the Caucasus ridge, close to Roki tunnel connecting Russia to South Ossetia. A video shows them emerging from the southern side of the tunnel in the early morning of August 8, hours before South Ossetia asked for help. Lie: Georgian troops attacked Russian peacekeepers in the conflict zone. This was another casus belli for the Russian “peace enforcement” operation. Fact: Videos from morning August ’08 show Georgian troops walking peacefully past an undamaged peacekeeper lookout. Out of all the peacekeeper outposts, fighting broke out at only one of those, with Georgians claiming the peacekeepers opened fire first. According to a Russian article, a peacekeeper outpost was used to direct artillery fire at Georian forces. Lie: A US citizen took part in the conflict on the side of Georgia. Russian military spokesman Anatoliy Nogovitsyn showed a blown-up photo of a passport of a certain Michael Lee White, allegedly found in the conflict zone. Fact: Michael Lee White, an American professor working in China, lost his passport in Moscow’s airport in 2005. He spent the August of 2008 caring for his ailing father in the US. 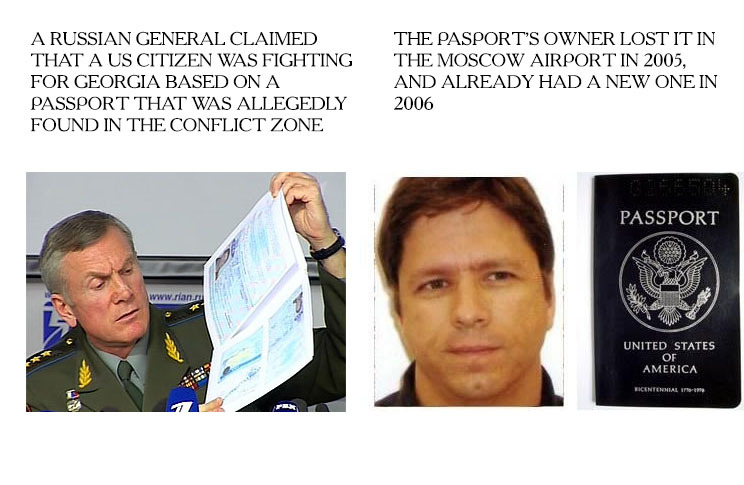 Kremlin claimed Mr. White’s passport had entry stamps from after 2005, bu failed to provide any further evidence. 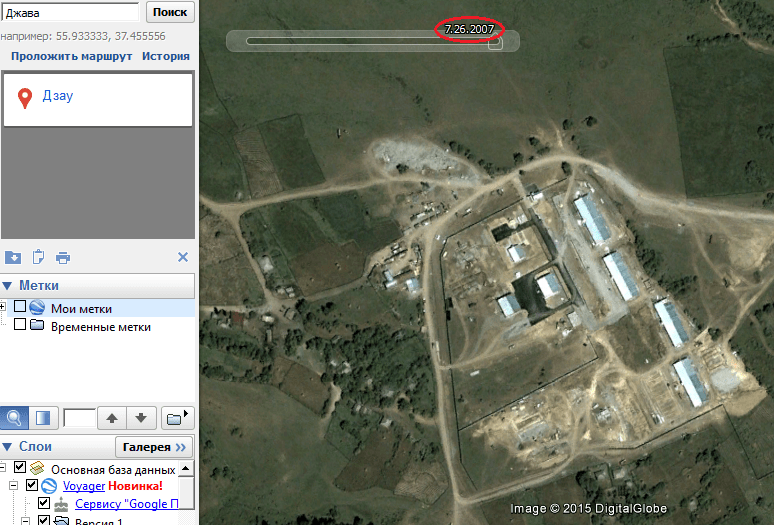 Lie: A Russian military base was created in South Ossetia in 2009. 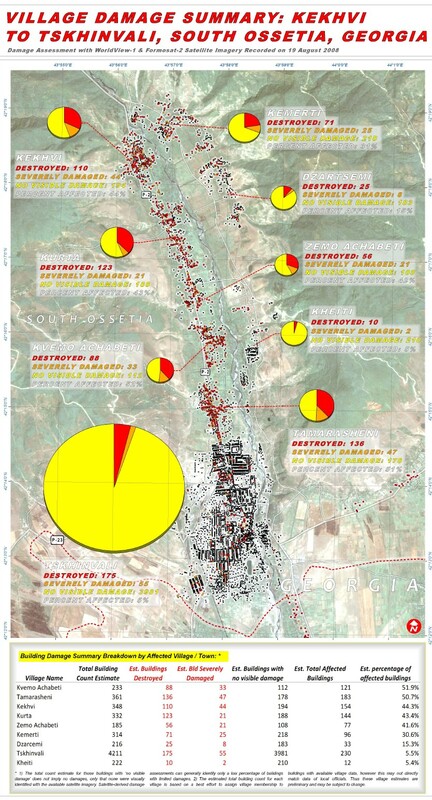 After the war, Russian involvement in South Ossetia intensified, military cooperation treaties were signed and a military base was founded in the town of Java February 2009. This installation currently houses Russia’s 4th Guards Military Base. Fact: In 2007, Saakashvili cited intelligence Russia of founding a military base in Java. Today, Google Earth satellite imagery shows the construction in full swing in July 2007, back when Russia still recognized South Ossetia as part of Georgia. 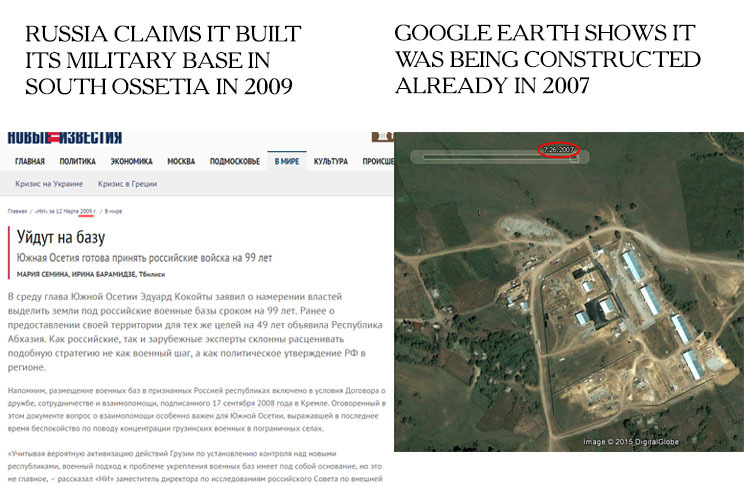 A video from August 8, 2008, shows South Ossetia’s “president” Eduard Kokoity on what looks like that base without any signs of ongoing construction, suggesting that it was completed before the war even began. 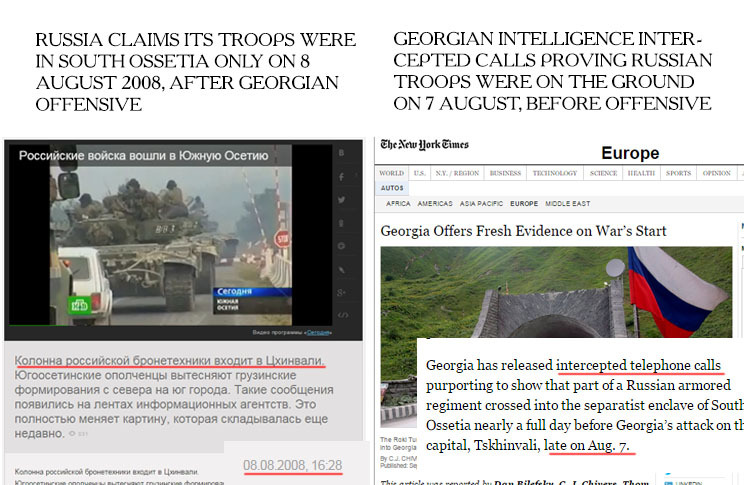 Lie: Ukrainian soldiers and far-right fighters aided Georgia in the war. Russia’s investigative committee claimed Russian planes were shot down by Ukrainian Buk operators who manned the anti-air systems sold to Georgia earlier. South Ossetian “authorities” showed a uniform with a UNA-UNSO chevron, thus making Ukrainian neo-Nazis Kremlin’s boogeyman way before Right Sector was even conceived. Fact: Ukrainian prosecutor’s inquiry found that no Ukrainian soldiers took part in the fighting, while technicians indeed had been in Ukraine to maintain the Buk missile launchers. UNA-UNSO also denied their presence in Georgia during the conflict. 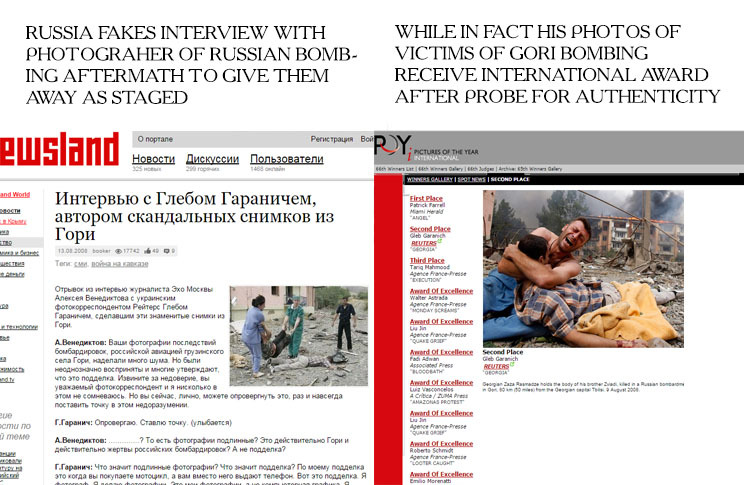 The “investigation” promptly died down, before reemerging years later in 2015, when Russia’s Supreme Court used Ukrainian nationalists’ alleged fighting in Georgia as a pretext to ban Right Sector and UNA-UNSO in Russia.
. An interview surfaced (ostensibly from Google cache) where Garanich admitted to a Russian radio host that he did stage the photos with dead civilians. removed Lebanon photos from their website after they were found photoshopped. Lie: Fox News host tried to censor Ossetian woman on air — at least in the version presented by Russian TV. During a live interview with two immigrants from South Ossetia they told about the Georgian attack and blamed Saakashvili for the war, yet the host tried to silence them and cut them off abruptly. Fact: As the family returned from South Ossetia to San Francisco, they told CBS about their version of the events, presenting the Russian narrative. Russian news showed a highly edited version of the Fox News interview, inserting the host’s heavy coughing silencing the interviewee’s and shrinking to produce an effect of censorship.